You’re the managing editor of the online publication Art of the Title. How did you find your passion for title design? If it’s possible to grow up as both a bookworm and a couch potato, that was me. I voraciously tore through books while also wearing out VHS tapes. As a teen, I thought graphic designers were akin to rock stars—that’s how cool the world of design seemed to me. I’ve been shuttling between graphic design and literature ever since, straddling that murky space between them. It’s fascinating as hell to distill ideas and whatever’s swilling around in the ether into a form that can be understood by others. When I joined Art of the Title in 2011, it was still a small blog, and I was just interested in writing more. But as I got more involved in managing the site, developing features, and writing more and longer pieces, I started to see how deep the rabbit hole goes. A title sequence can be an entire world in microcosm. It has been endlessly intriguing and a real privilege to learn about the depths of this art form and share that with others. How many times do you have to watch a title sequence before you can write about it? There’s no magic number! To analyze a title sequence, you have to understand its context—what it’s introducing and/or closing. Excepting Casper Kelly’s utterly bananas short “Too Many Cooks,” no title sequence is an island. They’re created to support a larger work—films, TV shows, video games, conferences and even music videos—so by necessity, unraveling a title sequence means understanding the story it’s helping to tell. In order to write about a title sequence, I have to watch it a number of times—particularly if it’s a television sequence—as well as the larger work. TV titles are meant to be watched over and over, so understanding how that functions means grasping that experience. On my first viewing of any title sequence, I pay attention to the impact and the emotions that are being triggered. On my second viewing, I investigate that, clock the symbols, note the techniques and consider how it’s all functioning. For something like Tom Kan’s work on the film Enter The Void, the first experience is the purest and most visceral. For something like the sequence for the comedy film Dinner for Schmucks, featuring dioramas created by The Chiodo Brothers, repeat viewings really deliver the good stuff. Do you apply your editor’s eye to the shows, movies and other content you watch in your downtime? I do! It’s impossible not to, really. The more I learn about the history of title design, filmmaking and writing and the various crafts of these worlds, the more fascinating it all becomes. The magic doesn’t wear off when you know the magician’s tricks. How are title designers adapting to the rise of online streaming? Title sequences are often prestige projects for designers and studios—not their bread and butter. For studios, adapting often means being willing and able to accept low fees, working around insane turnaround times, and using freelancers to help keep costs down and increase resources while primary staff focus on commercial work. The rise of online streaming and the popularity of title design have created a lot of opportunity as well as a lot of competition for these projects. Also, with the rise of online streaming, there’s a plethora of content being produced, so designers have to be flexible and work in a variety of styles. In this kind of marketplace, it’s not especially useful to have a signature look, so being able to pivot and adapt aesthetically and technically can really determine your trajectory. You’ve said that “using new digital tools, more people than ever can make their own titling sequences.” How does this democratization come across in the design of today’s title sequences? There’s just so much of it. Title design as an art form has boomed in the last decade. I mean, title design is now being taught at multiple education levels, from high school to university to PhD studies. I hear all the time from teachers who use Art of the Title in their classrooms and from students who reference it. I teach undergraduate students, and I take them through title design projects as well. Students can use title sequences as case studies to understand how to distill a story into small portions, establish mood and set up narratives. What conversations are you trying to update in the realm of design? In particular, I highlight the women and people of color who often go uncredited and rarely make it to the level of creative director. This is a problem in many creative industries, and title design isn’t immune to it. I’ve added dozens of designers who happen to be women to Art of the Title in the last two years, so that now, when you scroll through the Designers page, the women of title design are a lot more visible. In March 2015, I started the hashtag #womenoftitledesign to create a resource of women who design titles for film and television. I also create and edit pages on Wikipedia, usually for women designers throughout history. A personal pet peeve is when people attribute a title sequence created by both Saul and Elaine Bass to just Saul Bass, erasing Elaine’s credit and contribution. You’ll probably catch me correcting someone about that on Twitter! How has studying title sequences informed your understanding of design history? It has deepened my understanding of design history, giving it texture and valleys and sharp edges, while also enabling me to contribute to it—to actually write it. My work on Art of the Title involves conducting and publishing firsthand interviews with craftspeople that existing literature has neglected. Design history is written by a select few, so being able to shed light on forgotten and underrepresented figures has been a beautiful part of this work. Studying title sequences has also given me a window into the film, design and motion design industries—how these studios function, how the movie machine works, how creators are treated, how awards are given. Like any other industry, the realm of title design has its bright figures and its villains, so learning to navigate that terrain has been as vital as viewing and analyzing exciting title sequences. Making connections between projects that occur 50 years apart or around the world from each other—to see how an idea has been plucked from 1942 and brought into the year 2003, warped and shifted along the way and made fresh again—is so rewarding. For me, it’s an in-depth and long-term study. It’s not just academic, and it’s not just business. And after all these years, it’s also personal. 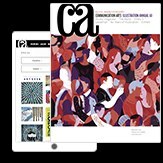 Lola Landekic is the managing editor and co-owner of Art of the Title. 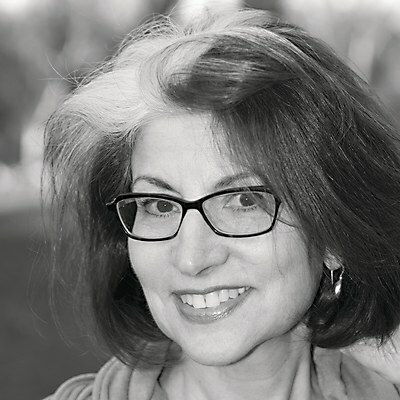 She is also senior book designer at HarperCollins and a professor of communication design at Sheridan College. She lectures internationally about title design. Landekic holds an undergraduate degree from the University of Toronto and a graduate degree from the Nova Scotia College of Art and Design. She is based in Toronto, Canada. Headshot by photographer David Pike. 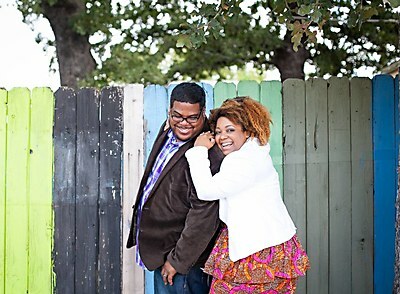 Regis and Kahran Bethencourt infuse children’s photography with authentic storytelling, and have fun at the same time. 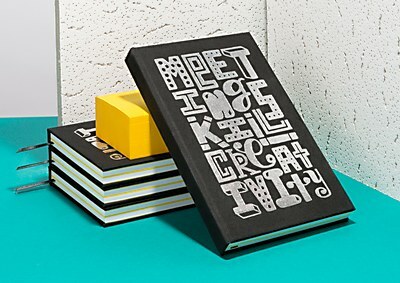 Just in time for the holidays, digital print and design company MOO launches a Timothy Goodman limited edition notebook.